The Moonraker Hotel is located on the outskirts of Bradford on Avon and is a grade two listed Manor house, making it a perfectly picturesque wedding venue. On one of the hottest days of the year, I visited The Moonraker Hotel to do some photography for Louise Beukes, founder of the UK wedding blog BLOVED. I was extremely happy to be invited along to snap some shots of this beautiful wedding venue and see exactly what this hotel had to offer for couples looking to get married here. I’ve put together some information on weddings at The Moonraker Hotel to help you when planning your big day. The Hotel is set within 4 acres and features a stunning walled garden, apple orchards, bee hives and perfectly manicured lawns. There is a lot to this venue and I was surprised– and happy– at the number of photo opportunities for couples within the grounds. It really is a gorgeous wedding venue with plenty of outdoor space. Couples are spoilt for choice in terms of wedding photography! You can take a stroll through the stunning walled garden whilst sipping your first glass of bubbly as newly weds or have couple portraits outside the front of the house itself. What I really love about this venue is if it rains, you can still get away with having photos outside by taking cover under the pagoda-type walk way that they have between the main hotel building and the marquee. The milking parlour is where couples say their vows to each other and with lots of natural light flooding in through the windows, this room is photographically gorgeous. Holding up to 150 guests, the milking parlour is plenty big enough for couples who are looking to have quite a big wedding party. With rustic chairs, pretty lighting and a huge fire place to wed in front of– the milking parlour is very much a romantic setting. The Moonraker Hotel also has it’s very own fully heated Green House Marquee which features handmade wooden tables and lime wash chairs, giving it a very rustic feel. This is where the wedding breakfast is held. As you can see from the pictures, the tables were laid out in a big square and from a photographers point of view, this is far easier for capturing the speeches! 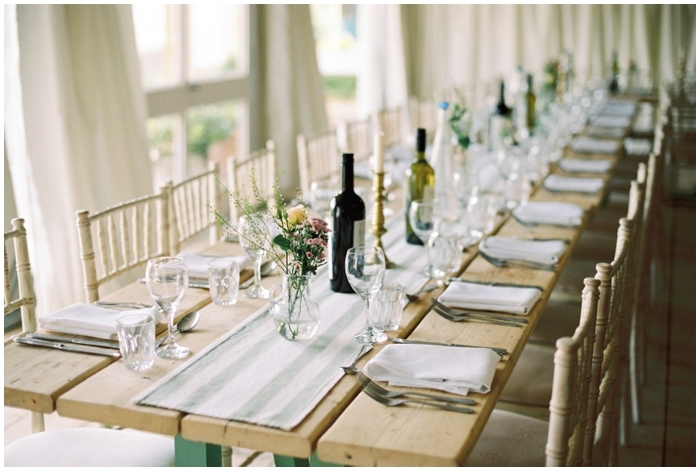 If however, you are really set on round tables or maybe a different layout, this is also an option. Back to the milking parlour which doubles up as the ceremony room and late night party room where your guests can dance to their hearts content. There is a dedicated bar and also an outside terrace featuring fire pits for keeping your guests warm in the evening. The milking parlour is a really pretty room which you can wow your guests with. There is also a small games room and smoking area for your guests to entertain themselves in. There are 21 bedrooms at this venue all with en suites, wifi, and flat screen TV’s. I was shown to the bridal suite which features a four poster double bed, exposed beams, and steps leading into a gorgeous bathroom with a free standing bath! To find out more information on booking your wedding day at The Moonraker Hotel, including menu options and special offers, visit their website.